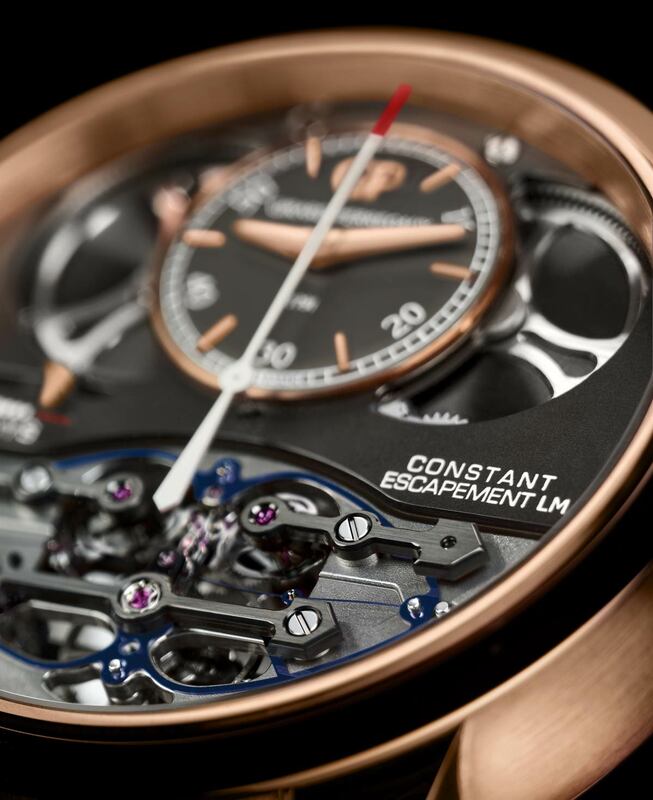 First introduced as a prototype in 2008, the Constant Escapement – whose name is a nod to Constant Girard (1825-1903) which, together with his wife Marie Perregaux, founded the brand – represented a real breakthrough in watchmaking. Leveraging the extraordinary properties of silicon that enables the most innovative structures, this innovative mechanism could now supply the balance wheel with constant force that never dwindles. 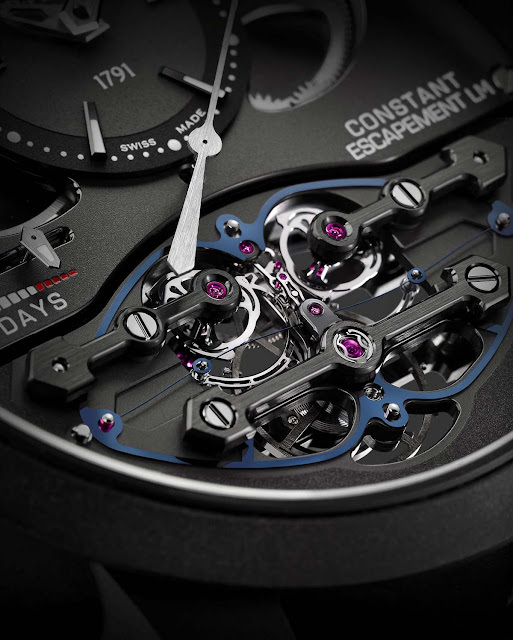 The invention was followed in 2013 by the first model implementing the solution (we wrote about it here) which, that same year, won the prestigious “Aiguille d’Or” award in the Grand Prix d’Horlogerie de Genève. This year Girard-Perregaux introduced a new Constant Escapement L.M. model featuring a design that is more technical and contemporary. The initials “L.M.” stand for Luigi Macaluso (1948-2010), who was the president of the Sowind Group owning the brand and the one who decided to trust and promote this movement. 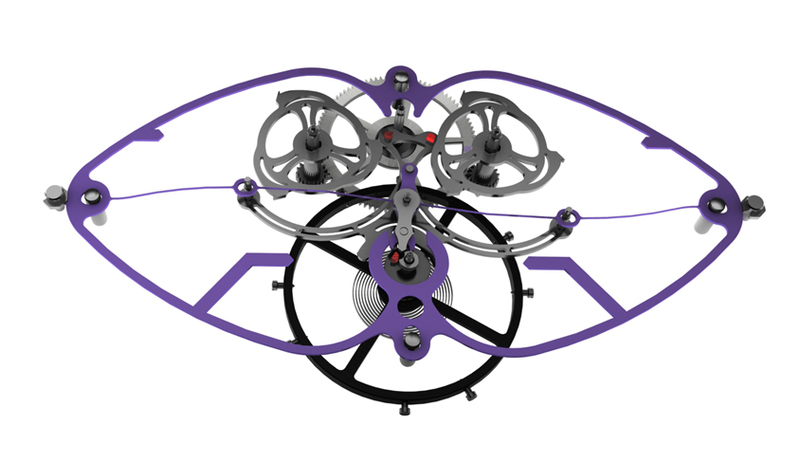 This entirely novel constant force escapement makes it possible to supply regular impulses to the oscillating organ, whatever the state of depletion of the barrel, thereby guaranteeing unprecedented precision. Another distinctive feature of this outstanding hand-winding Manufacture Girard-Perregaux movement is its power reserve. Two double barrels, comprising springs amounting to a total three metres in length, ensure an exceptional one-week period of autonomy – displayed on a linear indicator at 9 o’clock. Hours and minutes are read off on an offset counter at 12 o’clock. To ensure an unobstructed view of this mechanism, only the seconds hand remains centrally fitted. The GP09100 movement beats at a frequency of 3 Hz (21,600 vph). The imposing 46 mm-diameter x 14.84 mm-thickness case is water-resistant to 30 metres / 100 feet. Interesting but do we need all this precision? If precision is the main requirement, one could opt for a quartz watch, no? Should I spend such a huge amount of money for a watch, I'd rather spend for some complications. My two cents. 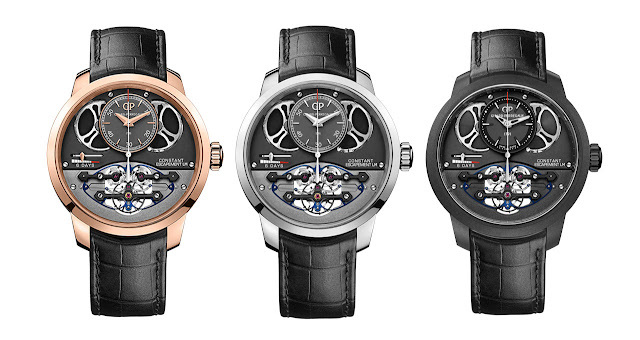 Girard-Perregaux Constant Escapement L.M. 2017. 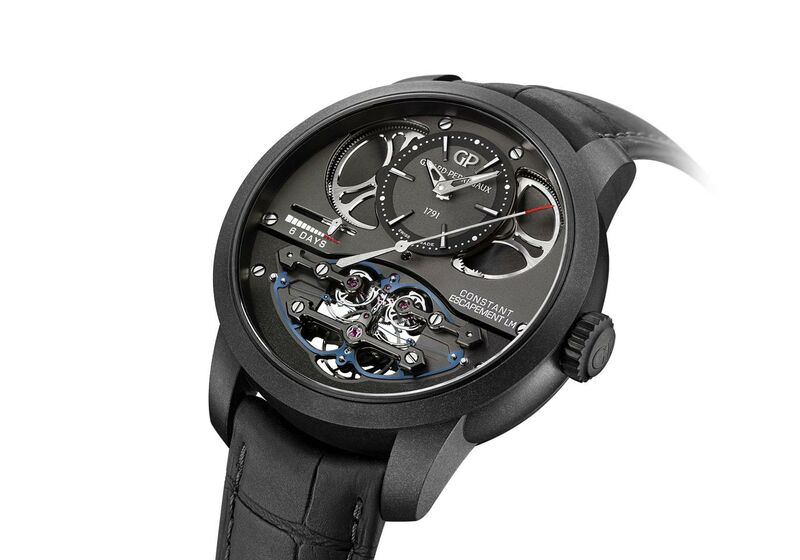 In 2017 Girard-Perregaux introduced a new Constant Escapement L.M. model featuring a design that is more technical and contemporary. The initials “L.M.” stand for Luigi Macaluso (1948-2010), who was the president of the Sowind Group owning the brand and the one who decided to trust and promote this movement. Featuring an all-black dial, the new Girard-Perregaux Constant Escapement L.M. 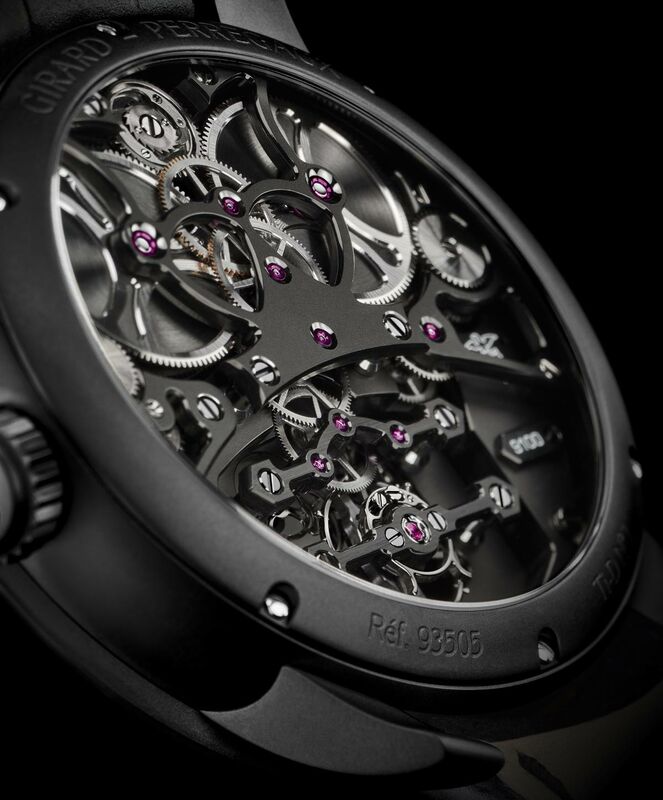 is available in pink gold, white gold or a carbon-titanium composite with prices starting at around Euro 166,000 / US$ 124,000.